This package is designed for those people who want professionally cleaned carpets but are running to a budget. However, don’t get the idea that this is just a cheap type of brush-off cleaning. No, we only have one standard of cleaning – thorough, professional and exhaustive. First we vacuum with a High filtration cleaning system specifically designed for super-high performance professional cleaning. We will move larger furnishings – such as chairs and tables – but for insurance reasons we ask you to move smaller valuable items such as ornaments before we arrive. 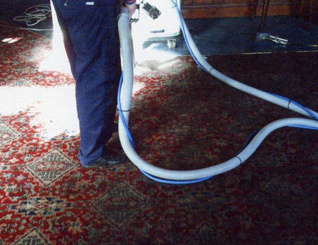 Next we will apply a heavy-duty pre-spray specially designed to electro-mechanically lift oily dirt and pollutants from your carpet fibres and suspend them floating in an aqueous solution ready to be quickly and safely extracted using our state-of-the-art extraction machines. We use special carpet drying equipment to help reduce the drying time. So you can use the carpets quicker. 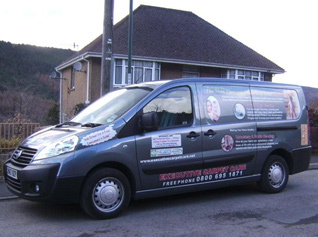 Where, appropriate we will groom your carpet to leave it in the best possible condition. This usually means we run a grooming rake over the carpet to ensure the fibres are tangle-free and as ‘fluffy’ as possible. Furniture is replaced back onto the carpet with protective foil tabs and Styrofoam blocks under the legs. Why? Well sometimes the moisture left in the carpet will leach out any colour-stain finish from the furniture leaving a (very difficult to remove) stain on the carpet. Remember, Twin vacuum Carpet Cleaning = More Soil Removed. Carpets Healthier and Drier GUARANTEED. It is important for companies to lead the way in promoting the health of staff, visitors and the environment by making better choices, like reducing waste, reusing materials, and recycling. Many carpet-cleaning companies are now leading the country in getting on board. Now we need to grasp further and significant opportunities to shift course again relating to how we clean and what we use to clean and this shift is particularly valuable to small owners and large business facilities managers. Let your staff and visitors and potential clients know that you care about them and the environment, contact Executive Carpet Care today and arrange a no obligation consultancy.